Our ARINC 429 to 3-channel 0-10V Analogue converter has finally been updated and is now avaliable. This new version is available in our new proprietary CNC aluminium blue anodised enclosures. The 3 ARINC 429 labels and their SSM and SDI values can now be set via switches on the PCB. The YED/A429-R2/VF6 is a ARINC 429 two channel receiver converter with 6 volt-free relay contacts. Each receiver monitors for Label nnn ARINC 429 for a specific bit pattern within them. When a specified label is detected containing the required bit pattern the respective relay is activated until such time as the same label is detected with a non-required bit pattern. 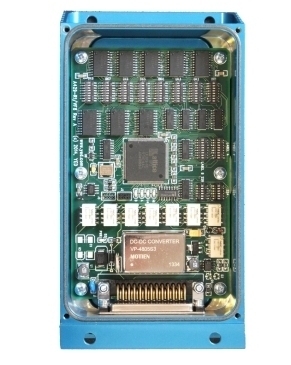 The converter can receive high or low speed ARINC 429 data automatically without user intervention. The unit is powered from an external 28 VDC (18-60V) nominal supply with internal current and thermal (102 ºC) fuse. The power inputs are also reverse polarity protected. The ARINC 429 to 8-Channel relay converter is an enhanced version of our popular ARINC 429 to 2-Channel Relay converter supporting 8 discrete volt-free relay contacts with additional options. 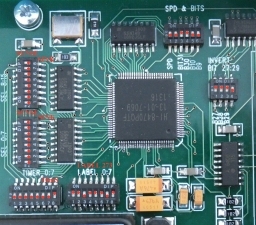 This converter will monitor the individual bits contained within two user selectable ARINC 429 Labels and switch individual contacts according to the state of those bits. YED will be at the Farnborough International Airshow this year. Hall1 / B13. 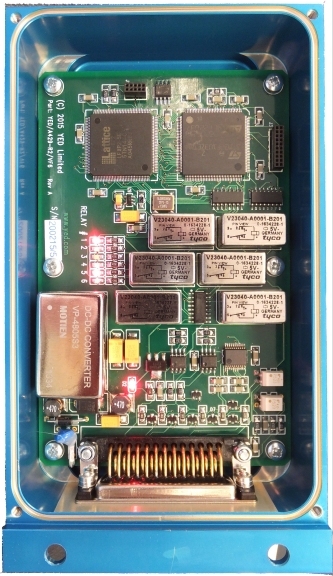 We are pleased to announce the latest addition to our "Blue Box Series" of ARINC 429 Data Converters. 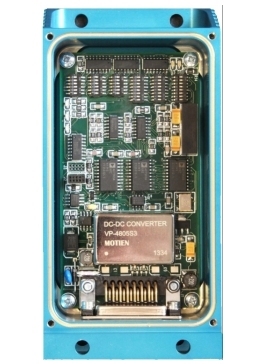 The YED/DIS-19/A429-T1 converter satisfies the requirement of transmitting the status of up to 19 grounded or sourced (28v DC) discretes over an ARINC 429 databus. The converter allows for user configuration of ARINC 429 Label value, SDI and SSM values, and the individual Sink or Source mode each Discrete input. In addition the transmitter bit rate is user configurable between 12.5kHz and 100kHz as is the transmit repetition rate from 360uS to 2.55S.